(Reuters) - Following a short-lived recovery, London's blue-chip shares gave in to pressure on Friday as jitters over the China-U.S. trade dispute fed into fears of a slowdown in the world economy, with bank and energy shares the hardest hit. 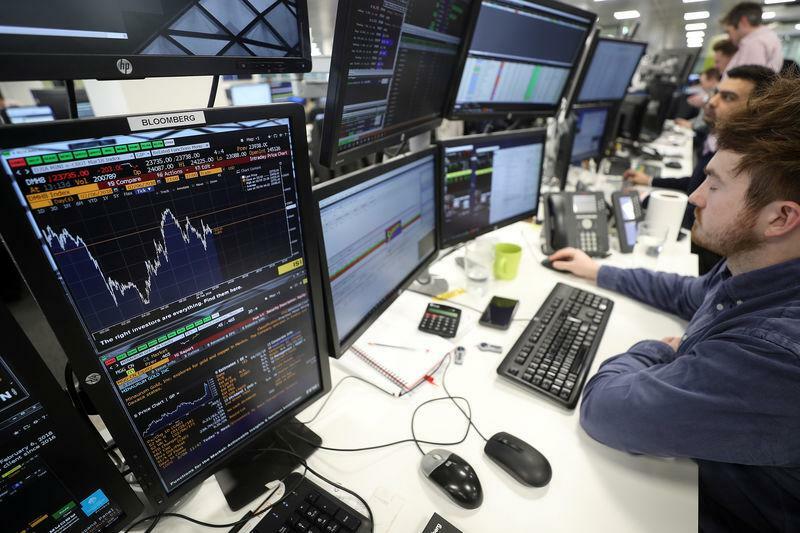 The FTSE 100 index ended 0.3 percent lower and the FTSE 250 slipped 0.8 percent, extending losses from the last session when the Bank of England (BoE) slashed its economic growth forecasts amid Brexit uncertainty. Investors also fretted about the protracted U.S.-China trade spat after news that U.S. President Donald Trump did not plan to meet Chinese President Xi Jinping before a March 1 deadline set by the two countries to strike a trade deal. "Whilst this is a bit of a blow, it's not in itself a reason to think trade talks are not going anywhere," said Neil Wilson, Markets.com analyst. Dragging down the blue-chip bourse were banks and oil stocks, which weakened as crude prices fell over worries of a global economic slowdown. RBS ended lower for a second session after a report that the British government would consider trimming its stake in the bank. The index still outperformed its European and U.S. peers on Friday, and managed to squeeze out weekly gains as BP's stellar results had pushed it to a more-than-three month high on Tuesday. The more domestically focused mid-cap index marked its worst week since December as the European Commission and the BoE cut their growth forecasts this week. Outperforming the main bourse, Ocado added 3.5 percent after having lost more than a billion pounds in market value over the last two days following a fire at its robotic distribution centre. SSE, one of Britain's "Big Six" energy suppliers, ended slightly lower after cutting its profit target. A Citigroup rating downgrade dragged its peer Centrica down 2 percent. Auto catalyst maker Johnson Matthey was knocked lower after rival Umicore warned of slowing vehicle demand in China, the world's top car market. Among a handful of gainers were homebuilders , which advanced on hopes that they might be expected to fill the void in house building left by Britain's local authorities. Britain's spending watchdog, the National Audit Office, said https://www.nao.org.uk/press-release/planning-for-new-homes that, as of the end of 2018, fewer than half of the local authorities had an up-to-date plan setting out their strategies to meet the need for new homes. Barratt added 1.8 percent, while peers Berkeley and Persimmon also rose on the main index. Luxury brand Burberry added 1.3 percent, boosted by French luxury handbag label Hermes' results and comments that sales momentum in its Chinese stores stayed strong in the fourth quarter. The British payment company Earthport surged 16 percent as Visa put forward an increased buyout offer, topping a bid from Mastercard. Investors shunned bookmaker shares as horse racing was postponed in Britain until at least the middle of next week after an outbreak of equine influenza. GVC Holdings, William Hill, 888 Holdings and Playtech all dropped.